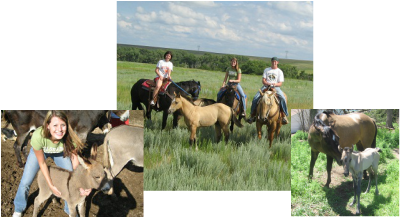 One of my favorite things to do growing up on a farm in rural Kansas was riding horses. My oldest brother and sister-in-law have a farm near my parents with a menagerie of animals: cows, horses, miniature donkeys, goats, pigs, and even a pet deer. I can remember riding horses from a very young age, and every time I visit home, I try to ride. Sometimes we move cattle, sometimes we go on trail rides, sometimes we pretend we are in a rodeo and practice the barrels and poles, and sometimes we just go for a leisurely stroll. Kansas doesn't have many mountains, but luckily it's close to Colorado. In high school, my youth group used to travel to Colorado for ski trips over spring break. The first trip was pretty rough, but once I figured it out, I developed a new love! It's crazy to think that I've been skiing for almost two decades. There is nothing like the cool breeze in your face, cutting through trees, or enjoying a fresh powder day on the slopes. 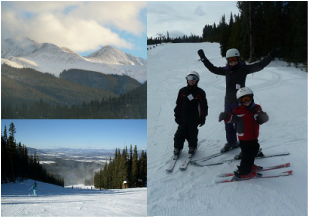 The past couple of years I have been teaching several of my nephews (I have 16 nieces and nephews) how to ski. My mom has always made delicious treats. Our family definitely comes together over meals, and we all look forward to her yummy pies, breads, and cookies. 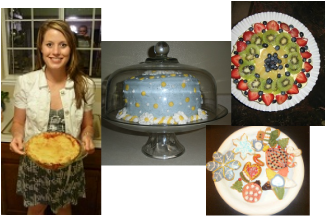 I've learned from her that baking can be a great way to relax and be a bit creative. I'm always experimenting with new recipes and often share the output with friends, colleagues, and I have even been known to bring students treats throughout the semester. I love to travel, visiting and learning from new cultures, meeting new people, enjoying various cuisines, and experiencing new places. I have long been interested in art and architecture and have taken several trips with art and language clubs. It's always incredible to see famous works in person! I've been lucky enough to visit several places within the USA as well as Canada, Mexico, Costa Rica, St. Thomas, St. Lucia, Spain, France, Italy, Greece, Germany, the Netherlands, and Hungary. I only hope that this list continues to grow and am thankful that because of mathematics, I have gotten to see several places I might not have seen otherwise. When I was younger, we used to have a HUGE garden on our farm. I always enjoyed planting the flowers and veggies but wasn't so great at pulling weeds. Now that I have my own home with raised beds (and fewer weeds), I really love gardening! It is so satisfying making a fresh batch of pesto or a grilled vegetable salad with produce that I planted, cared for, and raised from start to finish. I've learned that Minnesota is an excellent place to grow things! 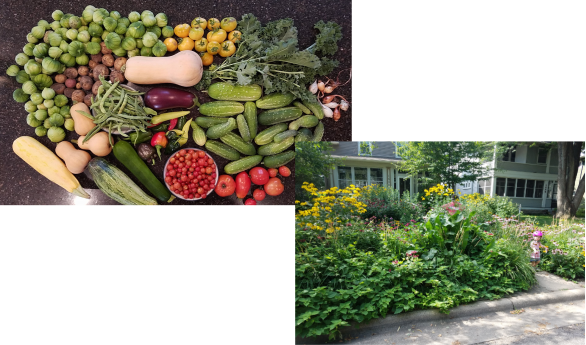 Picture of produce from my garden and my jungle of a front yard. One of my favorite summer activities is hiking. While in graduate school, I lived in Colorado which provided easy access to beautiful trails in the Colorado Rockies. In 2009, on a casual hike to Horsetooth Rock--our most frequent hiking destination--my then boyfriend of several years set up the camera to take a picture of us, ran over to me, got down on one knee, and proposed! We still "hike" in Minnesota, but it is not quite the same.